A major new piece of public art work inspired by the history of Castle Vale was unveiled in the area this week. 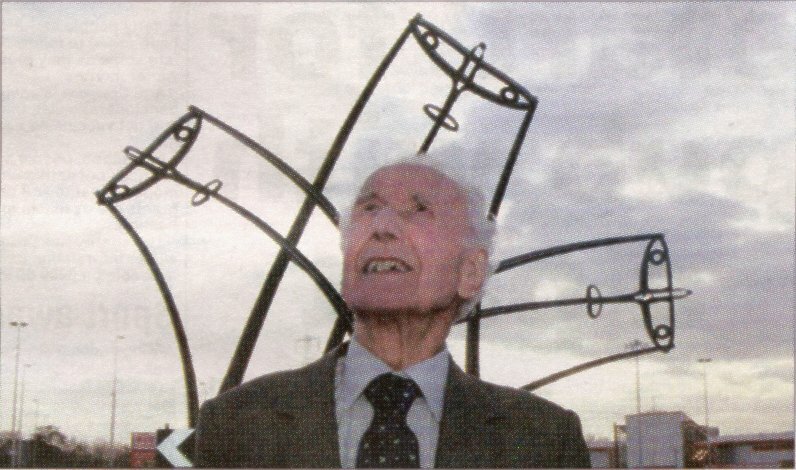 The £150,000 project, called Sentinel was designed by Tim Tolkien, grand nephew of JRR Tolkien, to represent the importance of the aviation industry to the region. It depicts three spitfires in starburst formation and was unveiled by Alex Henshawe MBE, who personally tested ten per cent of all the planes built at the Castle Bromwich Spitfire factory, now the Jaguar Cars plant. The project was made possible thanks to a partnership between the public and private sector, with Castle Vale Housing Action Trust and Birmingham City Council taking the lead. The main commercial sponsors were from Jaguar Cars, Rubery Owen Holdings and Cincinnati Machine Tools. Project co-ordination & structural design were by local engineering consultant, Maunsell. Set on the Chester Road island at the intersection of the Jaguar Cars plant and Castle Vale, the 62 ton steel structure will act as a gateway to the area. The money for the project came through the Artist in Residence scheme which was established in 1996 with lottery funds. Tim Tolkien was appointed, supported by Collective Art Noise, to develop a range of exciting public art pieces for Castle Vale in close consultation with residents. Mr Tolkien said: "The intention of the public consultation was to establish a preferred design for a gateway public art feature, one that would be impressive, reflecting the recent history of Castle Vale and providing residents with a sense of identity - something they would be proud of. "It soon became clear that residents were inspired above all else by the area's air history and favoured a sculpture featuring or capturing the spirit of the Spitfire." Above: Alex Henshaw MBE, the celebrated flyer who acted as test pilot for many of the Castle Bromwich Spitfires, at the unveiling this week. Tess Randalls, a spokesperson for the housing action Trust, said the Sentinel is great for the area. "It has taken around three years to bring the project to fruition, but it has been worth it because people have been so impressed with it. "It is a very innovative design which is a fitting tribute to the history of this area and has been developed with the full co-operation of local people. "It has attracted so much positive attention to Castle Vale and it will be a great thing for the city of Birmingham as a whole." Do you have memories of life in the factories of World War II? Perhaps you were one of those who worked on the war planes and munitions that played such a vital part in the Allied victory. Whatever your story, the Observer wants to hear from you. This article by Laura Mackin taken from Sutton Coldfield Observer 2000-11-17.